As the nomad inches its way towards the next stage in its restoration I thought I should take the opportunity to get a few other things done in an endeavour to get some momentum going with the project. 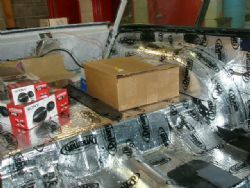 Two things came to mind, the console and insulation. I figured I would have a crack at making the console, you know the classic DIY project that should be simple, straight forward and take a couple of days. As usual, I was dreaming. Having watched a gazillion car related programs on the idiot box you get the impression that the teams involved punch these out in under five minutes and they all look sensational. Of course they don’t tell you that it took some time and you never see what ended up on the editors floor. Undaunted, I tackled the console with a calculated approach and built numerous templates out of cardboard before I made anything out of timber. I quickly learnt a valuable lesson – this would be infinitely easier if the car was in my garage and not in a workshop five kilometres away. I reckon I must have made over a dozen trips to test fit the bits I made and each time something else came up. Matters weren’t helped by the ridges in the floor, the lack of symmetry in the kick boards or the weird shape of the tunnel. I roughed it up, massaged it numerous times and then wised up and outsourced it to the experts to be glassed, smoothed over and finished. 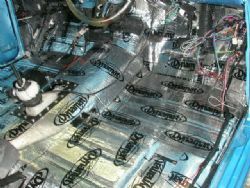 Next up was the insulation. I realised you could source this on eBay a hell of a lot cheaper than walking down to the local parts store so I grabbed a couple of boxes of Dynamat and figured I should be sweet. 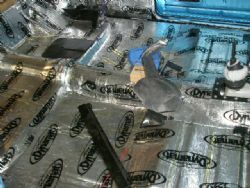 Thirty-six square feet per box should be enough to do the roof, floors and sides. Wrong! The first two boxes seemed to vapourise, a third was ordered and then a fourth… needless to say the nomad had an appetite and ate this stuff up. 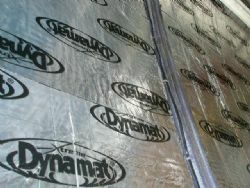 I had seen Dynamat and similar products numerous times but never installed it before. For anyone who deems themselves slightly handy, you could install it yourself. If you were good at jigsaw puzzles as a kid, that is an advantage. Peel and stick, black sticky back with a shiny silver topped sheet. This stuff sticks like the proverbial to a blanket – if you want to move it slightly after positioning it, it will lift the primer clean off the metal. Patience is rewarded when laying Dynamat. A handy tip is to take all the seats out before you tackle this job – it minimises the amount of mucking around and contortions you will need to perform. You also need to realise that if you don’t want it in a particular place, don’t lay it down as the odds on getting it off would be close to Buckley’s and none. It only took three days after the job was done to get the black bits of tar out from under my fingernails and the rubber sanding block I used to lay it with was a god send.